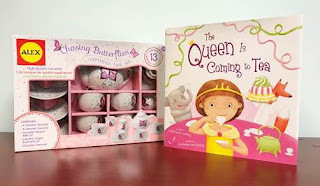 The Queen is Coming to Tea By Linda Ravin Lodding pictures by Constanze Von Kitzing. One day there was a knock at Ellie’s store. There stood the Queens footman. “A message from her Royal Highness.” He offered Ellie a note on a silver tray. When Ellie finds out the Queen is coming to tea, she snaps to attention! After all, the Queen deserves the best: cake from Paris, tea from China, lemons from Italy, “Pish posh,” says Ellie. “We can do it!” But while the Queen patiently wait? And what exactly will be waiting for the Queen? My Opinion: this is a great book for children in the picture in the book are very detailed along with having a great storyline for kids. I like the imagination and the different people Ellie meets along the way. My granddaughter Bella would love this awesome tea party set. 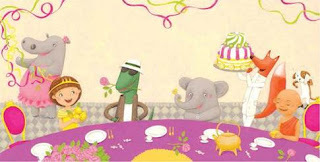 My 7 year old and I would love to have a tea party. Love making memories. Daily comment, Bellas birthday is Aug 19th. She would love this giveaway prize. Dailey comment. Bella would love a tea party set. Daily comment- Would be great. Bella is 7 and would love this awesome giveaway. Daily comment. Thanks for a awesome giveaway. Daily comment for Bella that would love tea set and book. Daily comment- Bellas birthday is Aug 19th, Nice present for her. Comment - so Bellas and I can have a tea party.